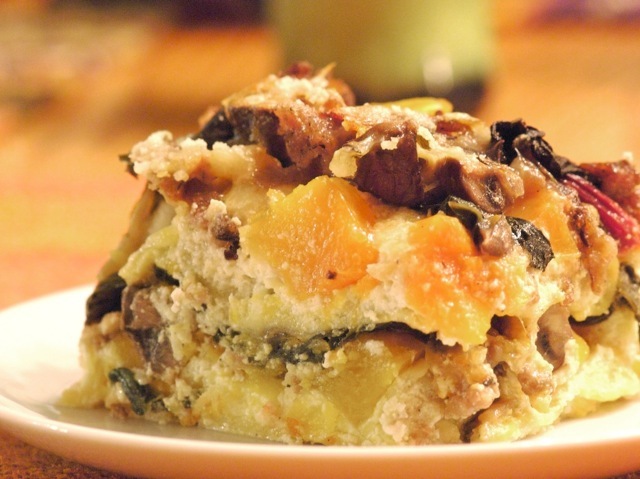 This lasagne calls for no tomatoes, but has plenty of other vegetables: butternut squash, greens, and mushrooms. If you don't have sausage on hand, or you prefer to leave it out, the recipe will not suffer. Preheat oven to 425 degrees. Spread squash in a single layer on a cookie sheet and drizzle with olive oil, tossing squash with your fingers to coat. Bake for 20 to 30 minutes, turning once, until tender and golden brown. Set aside. Turn oven down to 350 degrees. Meanwhile, brown sausage in a large skillet; when cooked, remove to a large bowl. Melt butter in same pan, add onions, and sauté until soft, about 10 minutes. Add mushrooms and continue to cook until tender, stirring often. Season with salt and pepper, and remove to bowl with sausage. Add chard to skillet with dried thyme and cook just until chard is wilted. Remove to bowl with sausage and mushrooms. Toss together. In a medium-size bowl, mix together ricotta, 2 cups mozzarella, 1½ cups Parmesan cheese, and eggs. Season with salt and pepper. Brush a 13-inch-by-9-inch baking dish with olive oil. Spread 1 cup ricotta mixture over bottom. Arrange 3 noodles on top (or 1 sheet). In the following order, layer the remaining ingredients: 1½ cup ricotta mixture, one-half of the squash, one-half of the sausage/mushroom/chard mixture, one-half of the (remaining) mozzarella. Place 3 dried noodles on top, and again layer the ingredients: ricotta, squash, mushrooms mixture, mozzarella. For the final layer, top with 3 noodles, spread with remaining ricotta mixture, and sprinkle ½ cup Parmesan cheese over the top. Cover with oiled foil. Bake lasagne, covered, for 30 minutes. Uncover and bake until heated through, about 30 minutes longer. Let stand 10 minutes before cutting into squares to serve. If you're lucky enough to live near a shop that sells fresh pasta, buy three sheets of pasta to substitute for the dried lasagne noodles in this dish.